The Washington Post published a second op-ed in five months from Turkish president Recep Tayyip Erdogan, one of the world's worst curtailers of press freedom. In November 2018, the Post ran an op-ed from the Turkish leader championing his state's efforts at uncovering Saudi Arabia's state-sanctioned murder of Washington Post journalist Jamal Khashoggi. "Over the course of the past month, Turkey has moved heaven and earth to shed light on all aspects of this case…" he wrote. "We owe it to his family and friends, including his former colleagues at The Post, to give them an opportunity to say their goodbyes and pay their respects to this honorable man." But as critics noted at the time, Erdogan holds the dubious distinction of being the world's worst jailer of journalists. At least 68 journalists were being held behind bars in Turkey as of December 2018, far outstripping the runners-up China and Egypt, the Committee to Protect Journalists reported. Tuesday, the Post hosted yet another Erdogan op-ed headlined "The New Zealand killer and the Islamic State are cut from the same cloth," which argued, "we must establish that there is absolutely no difference between the murderer who killed innocent people in New Zealand and those who have carried out terrorist acts in Turkey, France, Indonesia and elsewhere." 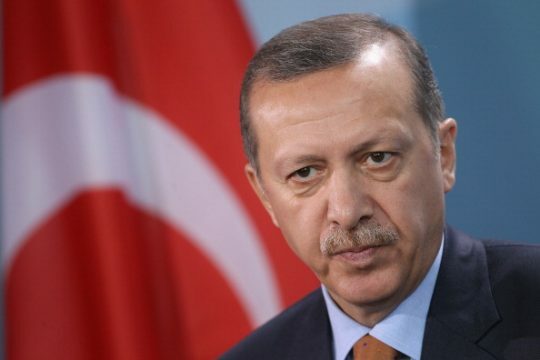 "In the aftermath of the Christchurch massacre, the West has certain responsibilities," Erdogan wrote. "Western societies and governments must reject the normalization of racism, xenophobia and Islamophobia, which has been on the rise in recent years. It is crucial to establish that such twisted ideologies, such as anti-Semitism, amount to crimes against humanity." Erdogan has been using video of the New Zealand murders taken by the killer as propaganda, airing the footage during election rallies. Playing off the fact that the Christchurch killer once visited Turkey, Erdogan denounced "occupiers who attempt to threaten our nation from tens of thousands of kilometers away." Erdogan's remarks prompted diplomatic rebukes from New Zealand and Australia. This entry was posted in Politics and tagged Recep Tayyip Erdogan, The Washington Post. Bookmark the permalink.